Manhattan’s newly opened Hudson Yards is all shine and no substance, and New York City deserves better says Alan G Brake in this Opinion column. This past weekend, the public gained access to much of the first phase of the vast Hudson Yards development on Manhattan’s Far West Side, one of the island’s last major swaths of developable land, now outfitted with trophy architecture, an enormous mall, a new public plaza, and several spaces seemingly designed for Instagram. Hudson Yards is not for us, because “us” means me, you, anyone, and everyone. Hudson Yards is for them, a narrow band of wealthy individuals, tourists, and high-income workers. Hudson Yards is not for us, because it is a development, not a neighbourhood. The Far West Side has always been Manhattan’s service entrance, a warren of loading docks, highway channels and exit ramps, gritty and mostly charmless. Hudson Yards makes these conditions worse. and loading dock entrances. The 10th Avenue-facing side presents a blank metal wall adorned with an enormous illuminated sign for Neiman Marcus, the Dallas-based luxury department story making its debut in Manhattan. Hudson Yards is not for us, because it avoids the street. It walls itself off from the vitality of one of the world’s great cities. The city-facing side of the development fronts 10th Avenue, but Hudson Yards offers no direct access. Rather, one must enter the mall and glide a full two stories up to reach the “plaza” level, offering retail tenants a captive audience to which to market. The mall, designed by Elkus Manfredi, does what malls do. It slows, confuses, and isolates by design. At five storeys (above the two-storey base) it is a warren of escalators, which don’t follow a predictable pattern. One gets off and then must assess how one gets back down or goes up an additional floor. Related is not currently obligated to say what it will do with this data. “The data is our data for the purposes of allowing us to make Hudson Yards function better,” Related president Jay Cross told the publication. Hudson Yards is not for us, because it is a billionaire’s fantasy of the future of city life. 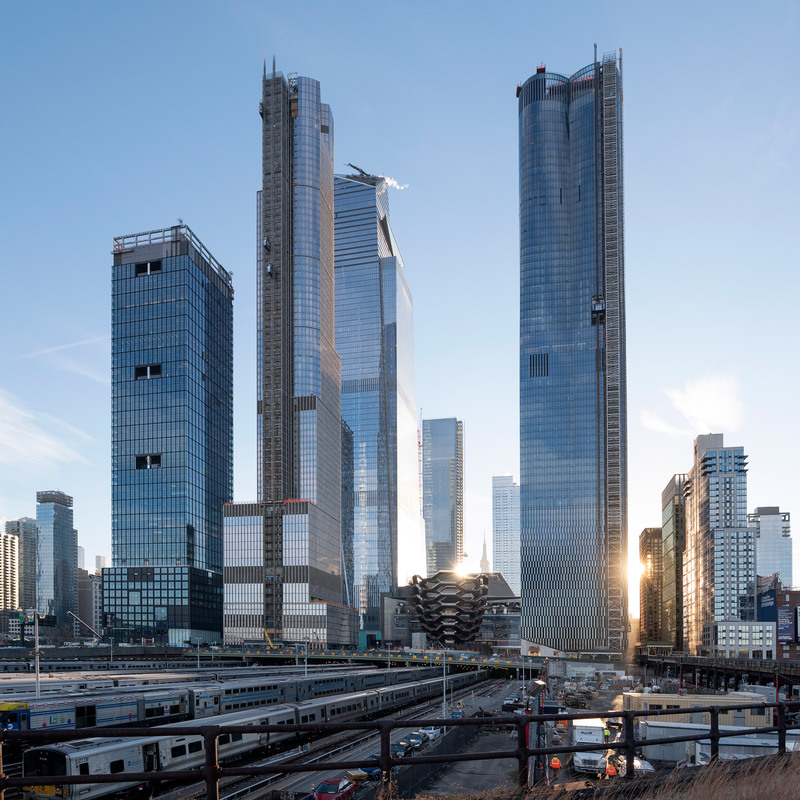 Architecture is slow, and Hudson Yards was conceived by the administration of Michael Bloomberg and built by Stephen Ross, the chairman and majority owner of Related Companies. As a place, Hudson Yards is blandly impressive thanks to its gigantism and the numbing acreage of blue reflective glass that stretches into the sky. Diller Scofidio + Renfro‘s unfinished building, The Shed, is the most intriguing (it opens to the public next month), yet its vast rolling roof and muscular structure are swathed in a cheap-looking grey ETFE skin resembling dirty bubble wrap. 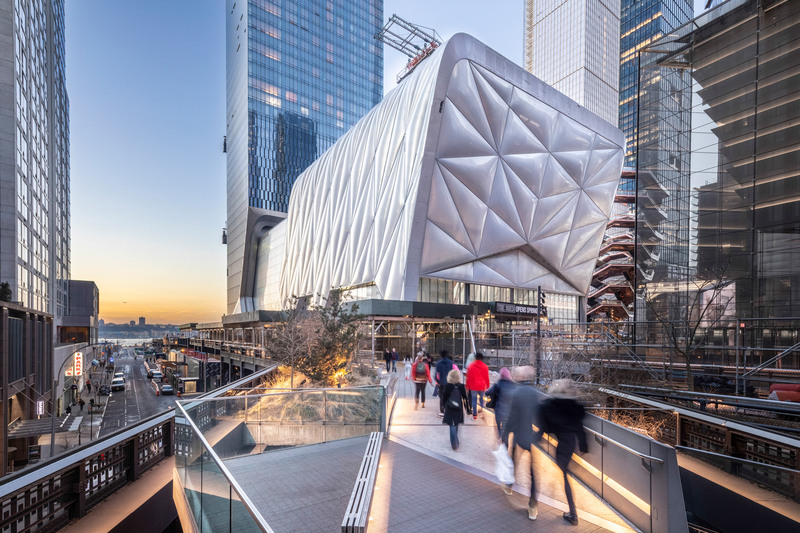 Though The Shed bills itself as “a new art centre for the 21st century,” it has also long been rumoured to be the future home of New York Fashion Week, another blurring of culture and commerce. Then there is Heatherwick Studio’s Vessel, a colossal viewing platform/bundle of staircases clad in shiny golden panels. Next to the repurposed industrial infrastructure of the adjacent High Line park, the Vessel is a piece of urban costume jewellery, a gawdy bauble without purpose beyond shallow adornment. The plaza, designed by Nelson Byrd Woltz, seems intended to discourage lingering or relaxation. Currently devoid of benches or chairs, the plaza is ringed by swirls of stone-walled planters, which create paths that lead nowhere and are, perhaps, intended to disguise the plaza’s awkward sloping grade changes as you move toward the Hudson River (the next phase of Hudson Yards will extend from 11th Avenue to the West Side Highway). The whole thing is ringed by a bollard-protected driveway for black cars and Ubers headed to Neiman’s (the degree to which cars are prioritised throughout the development is another instance of surprisingly out-of-date urban thinking). The lessons of Hudson Yards are clear. If we want to build a city for all of us, the task can’t be left in the hands of private developers. New York doesn’t need more billionaires. It doesn’t need more malls. It doesn’t need more cars. It doesn’t need more shallow spectacles masquerading as urbanity. Alan G Brake is a design journalist, editor, and critic. Formerly US editor for Dezeen, he has also been executive editor of The Architect’s Newspaper and has written for titles including Metropolis, Architectural Record and the New York Times. The post “Hudson Yards is a billionaire’s fantasy of the future of city life” appeared first on Dezeen.